Paris public prosecutor Rémy Heitz said his office was "favouring the theory of an accident", but had assigned 50 people to work on what he believed would be a "long" and "complex" investigation. Other officials have suggested it could be linked to extensive renovation works taking place at the cathedral. Thoughts are now turning to how Notre-Dame will be rebuilt. French President Emmanuel Macron vowed to reconstruct the historic building even as the fire still burned, while a number of companies and business tycoons have so far pledged about €600m ($677m; £519m) between them. The blaze was discovered at 18:43 (16:43 GMT), and firefighters were called. The flames quickly reached the roof of the cathedral, destroying the wooden interior before toppling the spire. But while a number of fires did begin in the towers, French Deputy Interior Minister Laurent Nuñez said they were successfully stopped before they could spread. The pavements here on the Left Bank across the Seine are packed with people shuffling along, stopping to take photos or pose for selfies, staring over at the huge, grey bulk of the cathedral. Police stop the crowds getting any closer, as firefighters use a tapering crane to inspect the facade by the cold light of day. The shrill whistles of traffic police cut the air as the sirens of emergency vehicles pass through the hum of the traffic. But every so often, the birdsong reminds you it's spring in the City of Light. In the little square, the charred odour is unmistakable, mingling with the scent of food from cafés. A group of excited Dutch 14-year-olds has come back to see the ruin after the drama of the blaze they witnessed last night, on their first trip to Paris. They have a packed agenda but they are solemn and respectful when they talk about the disaster. It's a sad moment for Dutch people too, they say. Everyone knows Notre-Dame. Fire brigade spokesman Lt-Col Gabriel Plus said: "The whole of the roof has been devastated... a part of the vault has collapsed, the spire is no more." 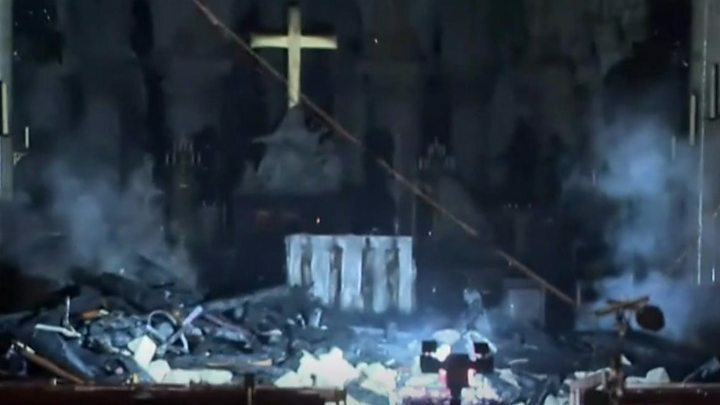 Photos appear to show that at least one of the cathedral's famed rose windows has survived, although there are concerns for some of the other stained-glass windows. Franck Riester, France's culture minister, warned that while the principal structure had been saved, the building was still unstable. Mr Nuñez said that "overall", the structure was in good condition, but that "some vulnerabilities" had been identified in the stone vaults and the remainder of the building's ceiling. Experts have not yet been allowed on site to assess the damage, due to the dangers. Individuals and groups are mobilising to help rebuild Notre-Dame. Hundreds of millions of euros have already been pledged. Air France said in a statement that the company would offer free flights to anyone involved in the reconstruction. French cosmetics giant L'Oreal and its founding Bettencourt family have promised to give a further €200m to the reconstruction effort. Total, the French oil giant, has also pledged €100m. 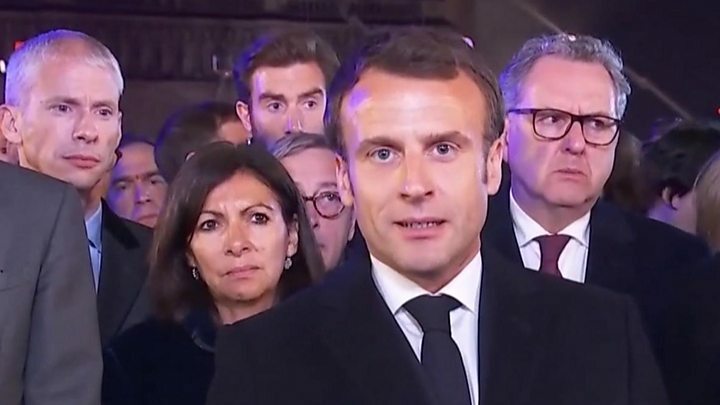 Media captionFrench President Emmanuel Macron: "We will rebuild this cathedral"
"We'll rebuild this cathedral all together and it's undoubtedly part of the French destiny and the project we'll have for the coming years," said Mr Macron, in an emotional address on Monday night. Russian President Vladimir Putin said he was happy to send experts to help restore the cathedral. The British government is also looking into what it can do to help, according to Ed Llewellyn, the UK ambassador to France. Spanish Culture Minister Jose Guirao said his country was also seeking ways to help. "Right now, above all, it's about moral support, solidarity and from there, whatever they need," he said. Emergency teams managed to rescue valuable artwork and religious items, including what is said to be the crown of thorns worn by Jesus before his crucifixion. A tunic King Louis IX is said to have worn when he brought the crown of thorns to Paris was also saved. Historian Camille Pascal told French broadcaster BFMTV that "invaluable heritage" had been destroyed. "Happy and unfortunate events for centuries have been marked by the bells of Notre-Dame. We can be only horrified by what we see."